COLOR 101: BASIC COLOR THEORY FOR PAINTERS This hands-on workshop starts with an introduction to the defining characteristics of color: hue, value, and chroma. 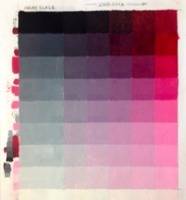 Then we’ll do a series of exercises: color-mixing assignments designed to be informative and enjoyable. We take an easy pace in this class, so you’ll have time to see and enjoy the color relationships as you mix them. You’ll come away with new ways of seeing and a solid foundation for additional exploration. We provide: all the painting surfaces you’ll need for the exercises, as well as handouts. • A small square paintbrush to make clean edges. • Gamsol and a container for cleaning your brush. • Oil Paint: Quinacridone Red 37ml or Naphthol Red 37ml, Cadmium Yellow Light 37 ml or Indian Yellow 37 ml, Phthalo Blue 37 ml or Ultramarine Blue 37 ml, Ivory or Mars Black 37 ml, and Titanium White 150 ml. We recommend Gamblin; the 1980 series is a good value “student grade” paint made with the same pigments as the “artist grade” paints. • for oil painters: a drying medium such as Liquin Impasto, Old Masters Maroger, Old Masters Venetian Wax Medium, or Gamblin’s Galkyd Gel (in a tube). • A roll of paper towels. • A pencil or pen. • Lunch, snacks, and water to drink. *For Non-Oil Painters: Since Aimee is primarily an oil painter, and oil paint has the advantage of staying wet on the palette, the demos and examples are in oil; however, you may work in another medium if you choose: acrylic, gouache, or acrylagouache. Please bring the same or equivalent pigments as listed above; also bring a water container, a spray/mist bottle to keep your paint wet, and a 1/2” square paintbrush, since these mediums may more easily applied with a brush, and cleaning brushes is less of an issue.